While only 88 seconds long, the first teaser trailer for Star Wars: The Force Awakens managed to do a lot in a short amount of time. It introduces both John Boyega and Daisy Ridley's characters, a new droid, ushers in the return of the Millennium Falcon, and sets up Oscar Isaac as an X-Wing pilot. It also alerts us to a new Sith presence. And with that comes a brand new lightsaber design, which has sparked some controversy. At first, the force seemed to be with director J.J. Abrams's new take on the classic lightsaber model. It's not the duel blade that George Lucas introduced in Star Wars: Episode I - The Phantom Menace, as wielded by Darth Maul. Or the iconic, classic single blade utilized by Darth Vader. Instead, it is a fiery cross in the claymore-style associated with the Scottish late medieval two-handed longsword. Like those swords, this lightsaber has two blazing quillons with quatrefoil terminations. 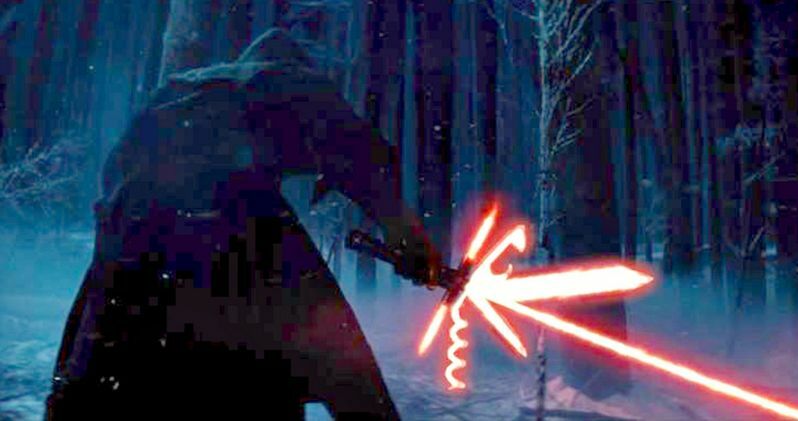 After a full day of being online, fans across the Internet have voiced their concern and general lack of enthusiasm for this new Sith lightsaber. The design is being furiously debated in forums and on Twitter. Some believe the design is too dangerous for the user, and could easily result in the loss of fingers. Others insist it will protect the Sith warrior's hand from suffering the same fate as Luke Skywalker, who had his hand lopped off in Star Wars: Episode V - The Empire Strikes Back. The claymore-style, made famous by Scottish knight William Wallace, is utilized to stop an enemy's blade from sliding past the hilt. Related: The Rise of Skywalker Title Mystery Already Revealed in The Force Awakens?